Kieran's Laid-Back Polka Dot Party Mama Say What?! | Mama Say What?! I have a special place in my heart for Mary Ellen’s little guy, Kieran, because he was born the same week as my own little man. It’s so cool being able to watch a baby grow from a tiny little newborn into an active, happy toddler! 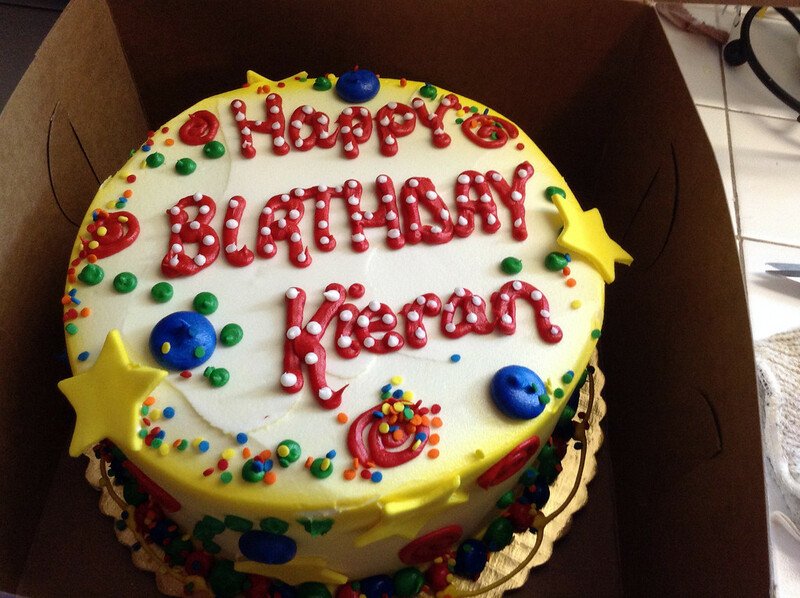 Mary Ellen had a fantastic, stress-free celebration for little Kieran’s first birthday. I love the birthday chalkboard she made for him. Check it out! We’re pretty into “laid-back” birthdays around here so I didn’t really have a theme in mind. But I found some cute polka dot paper plates for $.69 a pack and snagged them, so polka dots became our (kind of) theme. 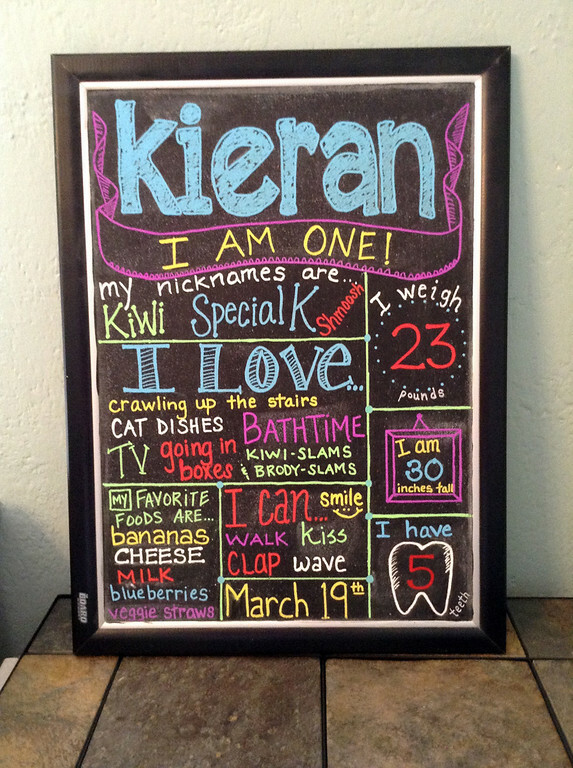 Without a doubt… Kieran’s chalkboard sign! I’ve made a sign before but it was for my in-laws retirement party. This was the first birthday board I’ve done. I had so much fun with it. I used a cork board that I found for $6 and painted it with three layers of chalk paint. I seasoned it with white chalk and then went to town with chalk markers. I scribbled some drafts on paper before I began. I started it about a month before the big day and spent a couple hours on it over a few different nights. Overall, I was pretty happy with all of the décor. 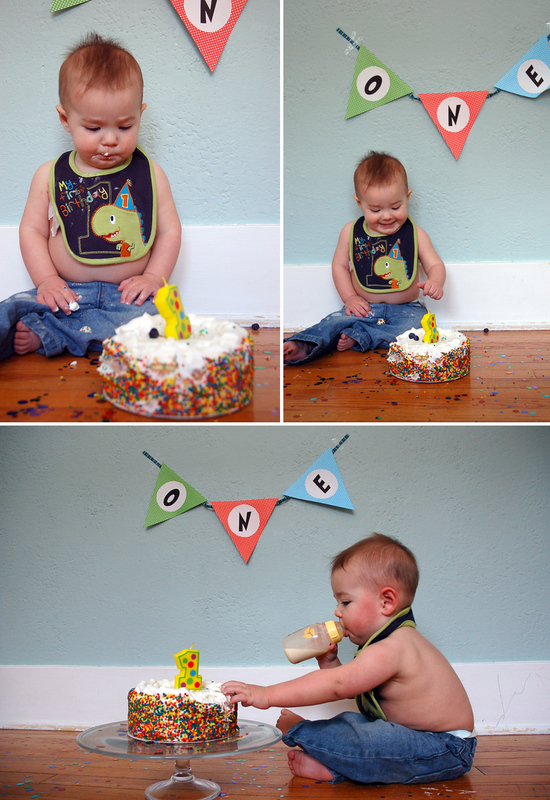 I made a Happy Birthday banner and a monthly photo display with some polka dot cardstock. I kept it simple (i.e. low stress) which is just how I wanted it. Singing “Happy Birthday” to Kieran was great! He was grinning from ear to ear. Hmmmmm… it was probably having some new kiddos over to play with. His cousins made the trip from a few hours away along with my good friend with her two kiddos. We had six kids in the living room, including my older son, so it was loud, messy and fun! My family loved seeing all of the kids playing together too. Not a thing – we had such a fun and laid-back evening! And I spent some time cleaning my house the day before, so a clean house is always a bonus. 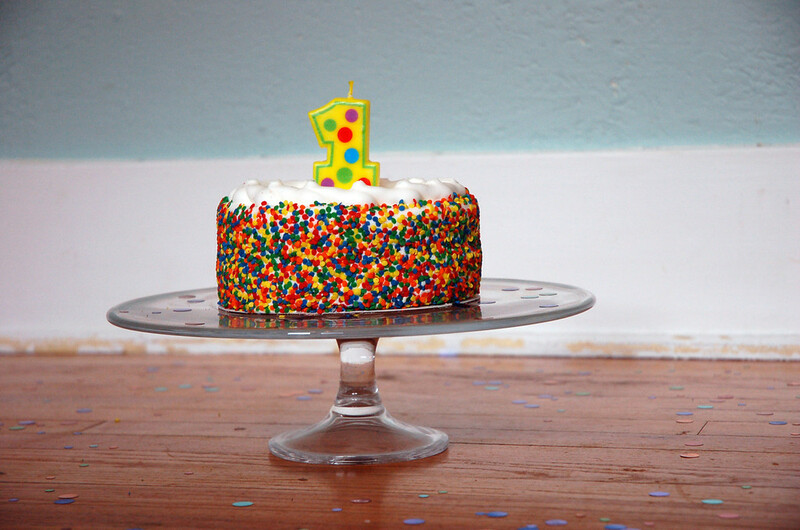 If you’re like us and not into the “big” parties, it’s totally fine to keep things low-key. We had a few snacks, salad, pizza, cake, soda and beer. Done and done! I had a lot going on at work the month of his birthday and couldn’t really handle planning a big party. I invited people via email and asked for no gifts (most people respected our request) and it really was just about an excuse for a family dinner. Added by Cassie W. on April 17, 2014. I like the day sensory bottles! That’s such an excellent idea!